Cauliflower is one of our favorite vegetables, but sometimes preparing it can be a bit of challenge. The florets are unevenly sized and smaller ones often crumble before the larger ones are cooked through. Riced cauliflower however, is the perfect solution. 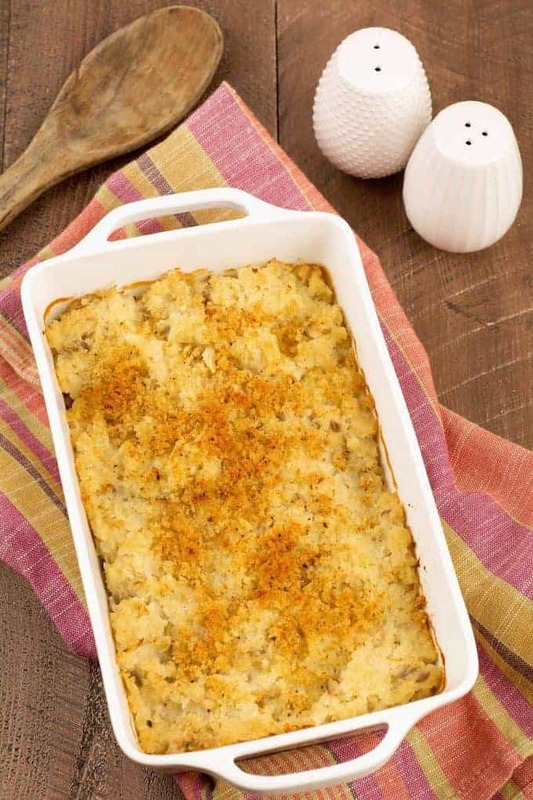 Not only is it convenient and easy to prepare, it’s perfect for making satisfying, low-carb side dishes like this easy-to-fix gratin. 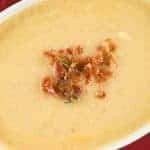 We love this recipes as is and make it often, but it can easily be adapted to include other veggies, herbs and cheese (see our notes). Preheat the oven to 375°F and coat a 1-quart baking dish with nonstick spray. Heat 2 tablespoons of the butter in a large frying pan over medium heat. Add the onion and sauté until soft and barely golden, 4 to 5 minutes. Add the garlic and sauté until fragrant, 1 minute longer. Sprinkle the mixture with the flour and combine well. Continue cooking for 1 minute, then slowly whisk in the warm milk, stirring constantly. Bring the mixture to a simmer and continue cooking until smooth and slightly thickened, 2 to 3 minutes. Add the riced cauliflower, 2 cups at a time, combining well after each addition. 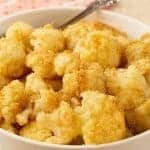 Continue cooking, stirring often, until the cauliflower is tender and heated through, 5 minutes. Season to taste with salt and pepper, then transfer the cauliflower to the prepared baking dish. Melt the remaining tablespoon of butter in the pan, add the panko crumbs and combine. 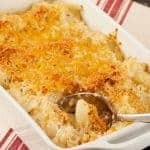 Sprinkle the buttered crumbs over the cauliflower and bake until the gratin is bubbly and lightly browned on top, 12 to 15 minutes. Serve immediately. 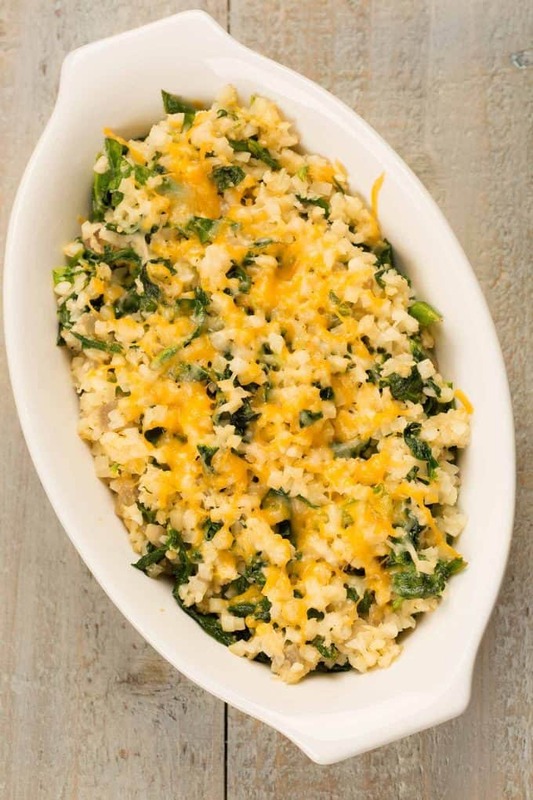 To make this variation, follow the directions above, but cut the quantity of riced cauliflower back to 4 cups (1 package frozen). Add 1/2 pound of chopped greens (spinach, baby kale or escarole) that have been sautéed until tender. If desired, replace the buttered panko topping with a handful of shredded cheddar cheese. Bake as directed above. Follow these simple steps to make riced cauliflower using a food processor. 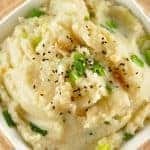 One head of cauliflower (depending on size) will make 4 to 6 cups and it can be frozen in airtight containers for up to 3 months. Trim any green leaves from the cauliflower and cut in into quarters. Remove and discard the core. Break one quarter into florets and add them to a food processor. Pulse just until the cauliflower is broken down into rice-sized pieces. Transfer the riced cauliflower to a bowl. Repeat with the remaining cauliflower, one quarter at a time.